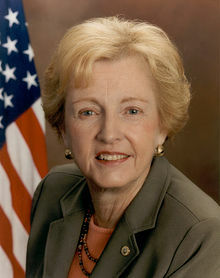 Jean Anne Carpenter Carnahan (born December 20, 1933) is an American politician and writer. She served as First Lady of Missouri from 1993 to 2000, and as her state's junior U.S. senator from 2001 to 2002. A member of the Democratic Party, she was appointed in 2001 to fill the Senate seat of her husband Mel Carnahan, who had been elected but died before taking office, becoming the first woman to represent Missouri in the Senate. This page was last changed on 31 August 2017, at 04:34.